Above: A View of the Abbey from the right side. Front door is on left side of image and hidden behind trees. Woodlawn Abbey is separate from Woodlawn Cemetery. It has its own Board of Directors and Perpetual Care Fund. However, keys can be borrowed from their Trustee at WesBanco in downtown Fairmont. Also, the Woodlawn Cemetery Superintendent has an additional key. If you call ahead, the Abbey can be opened for you. 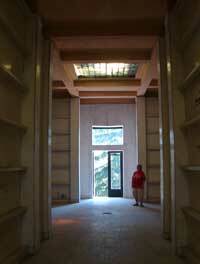 The mausoleum was built in 1924 by the Sanitary Mausoleum Company out of Delaware. The cost was around $100,000. 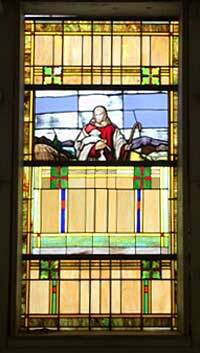 Sam Nuzum was the lead organizer in getting the Mausoleum built. There are 500 crypts, each cover being made of marble. In the deluxe sections, the caskets are side-on while in the regular crypts the caskets are end on. This changes the size of the marble that is used to seal the crypt. The building itself is granite. Interestingly, there are no crypts numbered "thirteen" in any of the eight sections. 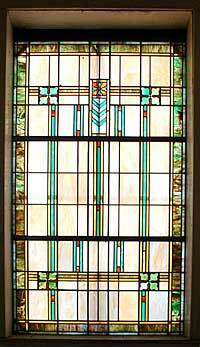 There are Art Deco stained glass windows in each section [see at left] and a large, badly damaged stained glass window at the back of the center aisle [see at right]. There are also 5 or 6 privately-gated areas that serve particular families. 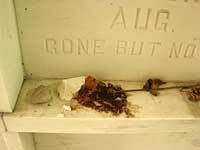 After the Mausoleum was built, the ground surrounding it was deeded back to the cemetery with the stipulation that only in-ground stones be used there. That way, no monument detracted from the Abbey. If you need access to the Abbey, please call one of our contacts on the HOME or CONTACT page. at the rear of the abbey has been repaired. Due to financial restraints, it was not possible to duplicate lower half of the vandalized section. Roll over image to see photo before repair.